No one likes wasting time at the airport. We like to show up within 45 minutes of our flight so that we don’t sit around. When we first got Global Entry and TSA PreCheck, it made the airport experience so much better that we raved about it to all our family, friends, and on previous posts like this one. I never had to worry about ridiculously long airport security lines, and I could predict roughly how much time I would need to get through to get to the gates. But over the last couple of years that has changed, and if you’ve ever flown out of big airports like ATL, you know that even the TSA PreCheck lines get extremely long (thanks to all those credit cards!). I’m glad people are figuring it out, because it makes the overall travel experience better for everyone. We need more happy people at the airport. Unfortunately, that means now we have to wait. That changed again last month! I’m a bit reluctant to share this time since the same may happen with this new way of travel, but since we’re here to be a resource to you, we figured it’s the right thing to do. A big thank you to Clear for providing us with a membership to help us with this review. All opinions are always our own. CLEAR makes it awesome again! For a while, we started to notice at some airports that people would skip the TSA PreCheck line by walking up to these white and blue kiosks. After spending a couple seconds there, they got escorted past our TSA line to the TSA agent checking IDs. Wait, what… how did they just cut the line? We always looked at them green with envy. Naturally, when we moved to an airport hub with CLEAR, we had to get it. 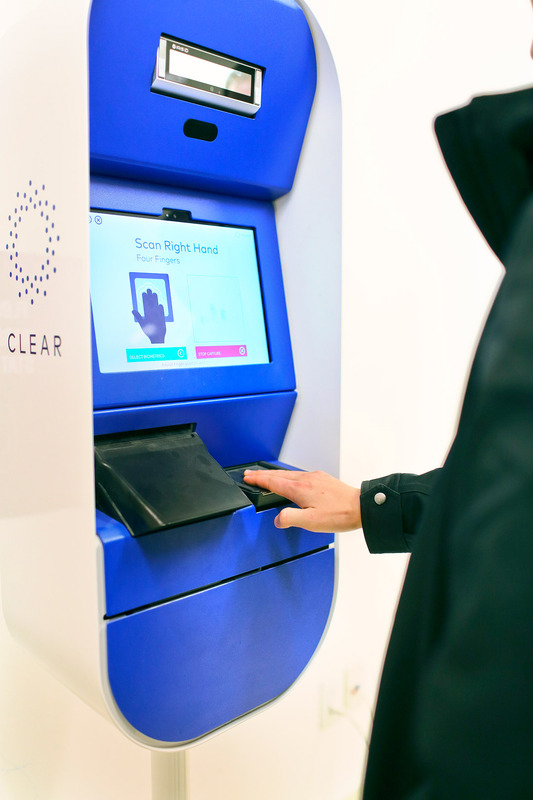 CLEAR is an awesome service that uses biometrics to get you through the airport faster. Biometrics is a technology that identifies a person using fingerprints or facial features like your iris. When you arrive, they have their own line where you walk up, scan your fingerprints and boarding pass, then get escorted directly to the TSA employee who checks your ID. It makes you feel like a VIP and I’m pretty sure I always have a stupid grin on my face when I get through TSA as efficiently as possible. 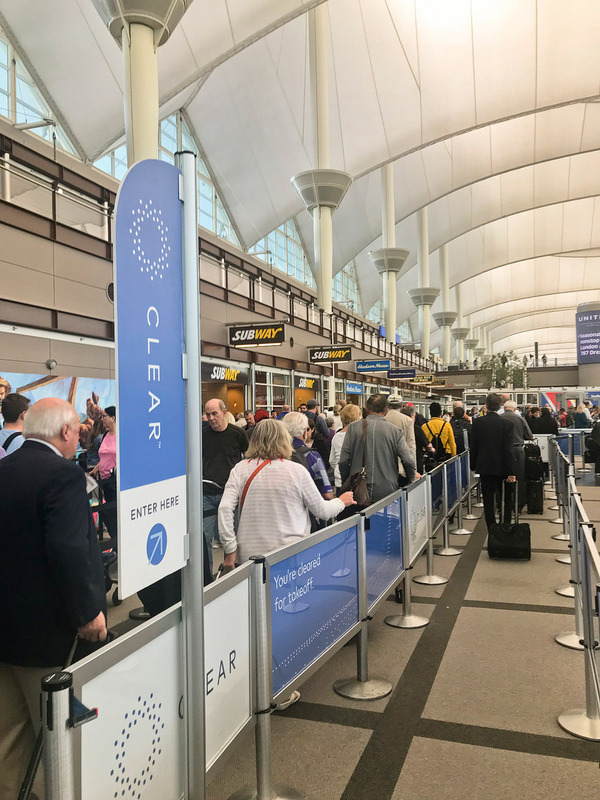 Many people are under the impression that CLEAR and TSA PreCheck are the same type of service but they are not competitors. They actually complement each other. You can get CLEAR with or without TSA PreCheck. They just take you directly to the TSA employee who checks your ID in either line. We still recommend getting Global Entry & TSA PreCheck to get through airport security faster. CLEAR speeds you through airport security. TSA PreCheck speeds you through physical screening. Global Entry speeds you through US Border Control and Customs. 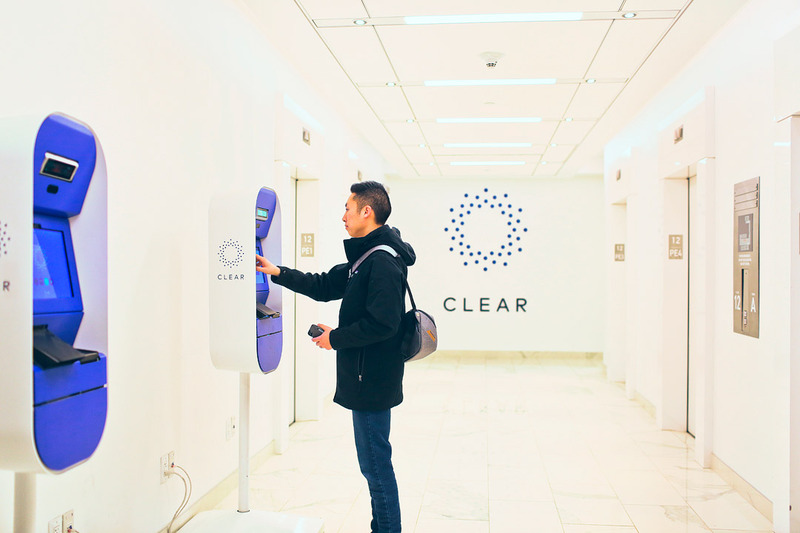 Clear is currently at the most traveled airports nationwide and is continuing to expand. See the complete updated list of locations here, and also see the 200+ airports that have TSA PreCheck here. BONUS. They are starting to use CLEAR at stadiums so that you can get into venues through an expedited line. To enroll, start online at clearme.com (you get two months free with our link!). 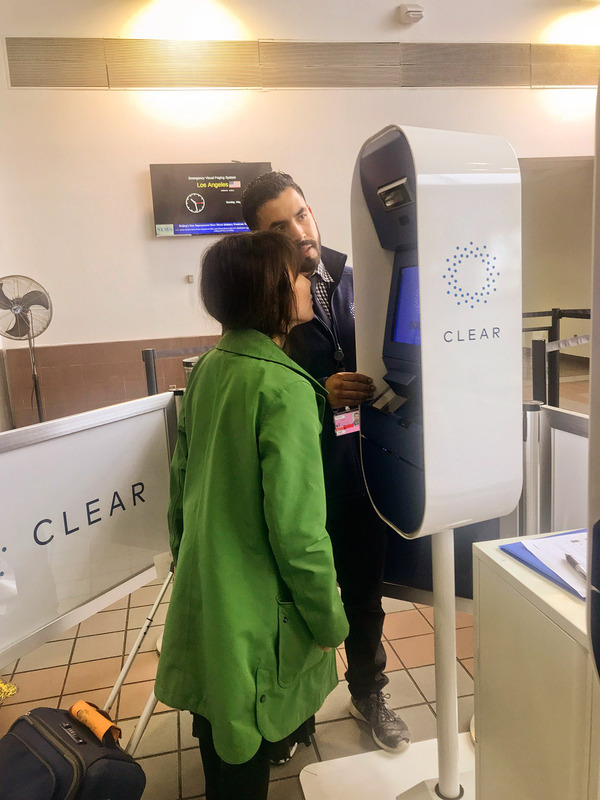 Once you’ve completed your online profile, stop by any airport or stadium where CLEAR is to link your biometrics to your account. 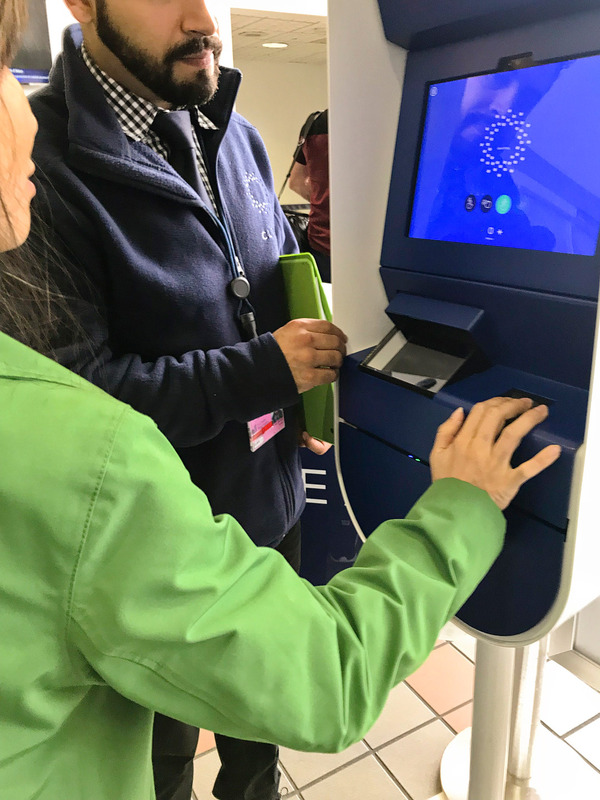 You can also do your entire enrollment at the kiosk, but it’s easier to start online. Signing up for TSA PreCheck is a bit more involved. First, you need to check if you’re eligible (basically if you’re a permanent resident or US citizen, and haven’t been convicted of any crimes, you should be good). You then have to fill out a pre-enrollment online. Once that’s done, you set up an appointment at one of the 300 application centers around the US. Before showing up, you’ll have to gather a few documents – a valid photo ID and a valid proof of citizenship (and immigration documents if that applies). Finally, you show up to an in-person interview where you answer some questions about yourself and travel habits. Anyone can try CLEAR free for a month. Annual membership is $179 and you can add additional family members 18 or older for $50. Children under 18 are free when accompanied by a parent who is a CLEAR member. If you are a Delta SkyMiles member, you can sign up at a discounted rate of $99. If you have reached a status, you get even further discounts. Platinum, Gold, or Silver Medallion members can sign up for $79, and Diamond Medallion members can sign up for free. TSA PreCheck is $85 for five years, or you can get Global Entry which includes TSA PreCheck for $100 for five years. American Express Platinum: Fee reimbursement for your Global Entry or TSA Precheck® application. An elite card that is designed for travelers that gains you access to a network of luxury lounges. Plus a stunning five Membership Rewards® points for every $1 spent on flights booked directly with airlines or through American Express Travel. Click here to check out this card and compare them to others. Chase Sapphire Reserve: Up to a $100 credit for Global Entry or TSA Precheck® application fee. The card that was so popular when it came out that they ran out of the material to make them. A strong travel card with 3x points on dining and travel and a $300 annual travel credit goes a long way to offset the $450 annual fee. Click here to check out this card and compare them to others. Master Card Black Card: $100 Global Entry / TSA Precheck credit. This card is designed for luxury from a stainless steel front and carbon back for durability, you’ll certainly be noticed when you pull this card out. It comes with a long list of luxury perks to make its users feel special, including airline and hotel credits, to VIP airport lounge access, to premium gifts, this card offers it all. Click here to check out this card and compare them to others. We highly recommend it if you live at or fly in and out of any of the CLEAR airports. If you don’t fly much, then maybe it’s not worth it for you. My rule of thumb, however, is that we can always make more money, but we can’t make more time. Plus, I especially don’t like taking off my shoes.